Elgandal Fort is orignally known as "Veligundula". Elgandal fort was build under the Kakatiya Dynasty nd served as a stronghold for the warrior Musunuri Nayaks. 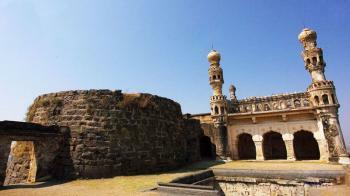 In 16 Century the fort was occupied by the Qutub Shahi Dynasty and posted Quinamul Mulk as commander. Subsequently, it fell under the administrative control of the Mughal Empire. When fort came under the rule of Nizams of Hyderabad and appoint Aamir khan as Khiledar of the fort. Dhamsa rebuilt and strengthened the fort in 1754 during the reign of Sikindar Jha (r.1803-1823). Bahadur Khan and Karimuddin served as Khiledars. Karimnagar was named after Karimuddin. While reorganizing the districts, Mahbub Ali Khan, the Sixth Nizam, shifted the District Headquarters from Elagandal to Karimnagar in 1905. Elgandal's rulers surrounded the fort with a crocodile filled moat of around 5 metres (16 ft) wide and 4 metres (13 ft) deep to prevent enemy incursions. Between October to March is the best season to visit the Fort. Summer Temperature ranges from 31°C to 41°C. Winter ranges Temperature from 15°C to 30°C. By Air – Hyderabad International Airport is the nearest airport to Elgandal Fort and is about 150 km away. By Rail – The nearest railway station to the fort is Karimnagar Railway Station. By Road – A number of RTC buses and private transport are available from Karimnagar.